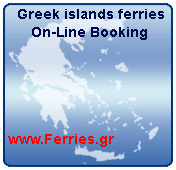 Mykonos is connected all year around with ferries daily from Piraeus and Rafina. During the summer there are more vessels and high speed catamarans from Piraeus, Rafina and also from many other islands of the Cyclades and the Dodecanese. From Mykonos there are daily connections with Syros, Tinos and Andros and during the summer with Paros, Naxos and Patmos, Leros, Kalymnos, Kos and Rhodes. Our page will be updated when schedules of Flying Cat and other high speed vessels when they will be available from 9 of April.